-The Staal line out to start against Detroit's top unit. I'd expect to see this all night. -Teams feeling each other out for the 1st few minutes. -MacDonald goes back to play the puck. TK steals it right from his stick and centers it to Staal with a wide open net in front of him. 1-0 Pens! Kennedy's 100th career point. -Geno takes another steal in for a breakaway but MacDonald denies his wrist shot. MacDonald had to make that save or he'd be in trouble. -Bertuzzi redirects one just past the left post. Fleury looked a bit out of position but no harm no foul. -Malkin with yet another impressive steal. Sets up Dupuis for a good shot but MacDonald makes the stop. He did give up a rebound but Dupuis rang it off the pipe. -Fleury absolutely robbed Zetterberg with the pad! Great save by the Flower. Wow, so much action already only 8 minutes into the 1st. -Chris Conner turns on the jets for a breakaway of his own. Tripped up into the goalie but he does get a backhand shot off. No call. 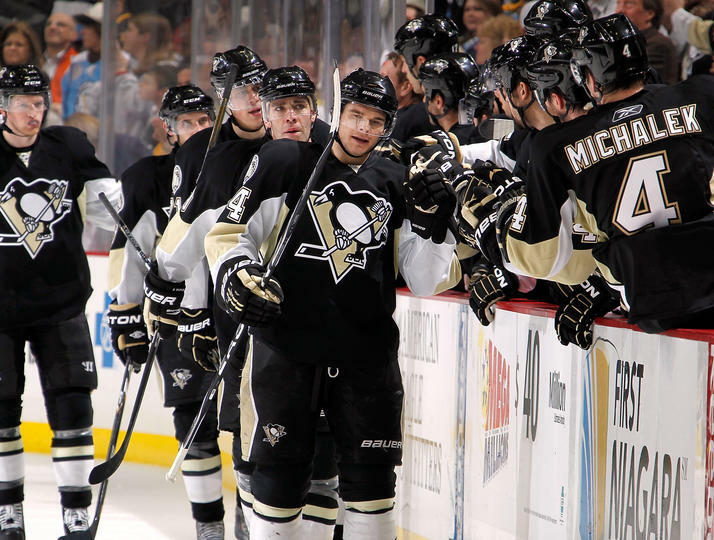 -Huge pressure generated by the Malkin line. Lots of shots including a great chance for Michalek but he just missed the net. Both teams attacking like its the playoffs. -Conner got another breakaway! He got hooked this time and there IS a penalty shot called. That's what speed does for you. -Conner takes the puck with speed. Skates straight at McDonald like a missile and chips one by on the backhand! 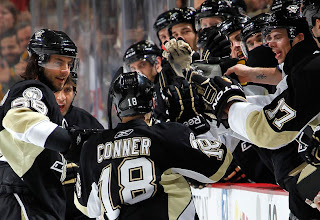 2-0 Pens 1st career penalty shot for Cons and the 1st successful one for the Pens since 2007. -Geno accidentally mistakes the official for a blackshirt and passes it to him, but he realizes his error and hustles back to regain possession and set up a shot by Kunitz. -Fleury with a couple of nice saves on Helm with 2 min remaining. -Mike Rupp with a nice turnaround shot. Ref blows the play dead with the puck not frozen. -Staal line ends the period with a strong last shift. Notes: Solid period by the Pens. It is really important to get a good start against Detroit and that is exactly what the Pens did. Tyler Kennedy continued his elevated play next to Staal and Chris Conner did what he does best...skate. And anyone who watched the 1st period can vouch that Evgeni Malkin played well, even though he doesn't have any points. He and the rest of his team looked hungry. -Letestu with a nice chance after MacDonald has trouble handling the puck. -Wings come right back down the ice after Letestu's chance and create one of their own. Fleury with a nice save on Tatar. -Cooke off for tripping. Detroit gets the first PP of the game. -Pens with an OK looking kill. Didn't look as aggressive as usual but they got the job done. -Another Detroit PP. Fleury with a great save on Zetterberg. 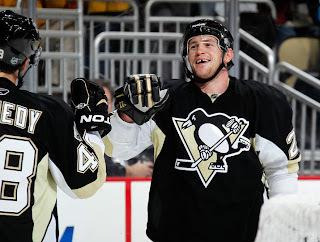 -Kunitz out of the box takes a nice pass from Staal and nearly banks one into the net. Somehow it stayed out. -Malkin with a shot, trickles to Letang who was right by the post. Letang had a completely open net but hit the far post. Celebrated a goal that just didn't happen. -Drew Miller all alone on a shorthanded chance. Letang had to trip him. Penalty called but surprisingly no PS. -Fleury and the D take care of the penalty. Flower looks solid tonight. -Staal line out for some solid pressure. The lines have been a bit jumbled this period with all the penalties. -Malkin with yet another steal. Sets up Dupuis for a shot and Kunitz buries the rebound! Malkin was screening in front. 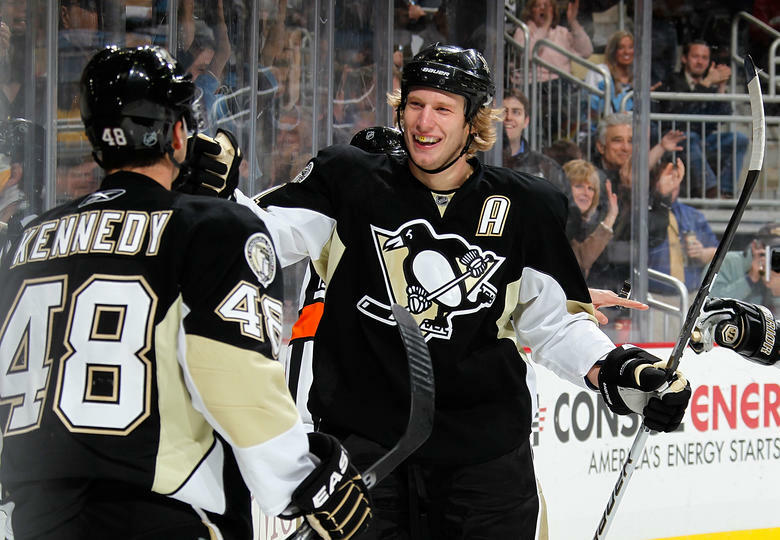 3-1 Pens Great quick response just 30 seconds after Franzen's goal. -Period ends with all momentum going Pens way. Notes: 18 minutes of that period belonged to Detroit. They outshot, outworked, and outhustled Pittsburgh and got themselves a few powerplays in the process. But Marc-Andre Fleury had the answer for everything until Franzen slipped that one in. The response by the Pens just seconds after Detroit pulled within 1 was absolutely critical and Kunitz was able to get one by MacDonald after yet another good steal by Geno. I like the looks of this one. -Red Wings are really trying to set up plays. Pens defense in "bend don't break" mode. -Wings are really firing. Fleury with a nice glove save as he sticks his glove way up in the air. -Not relevant to the game but just heard Letestu has signed a 2 year extension. Great news. -Pens finally starting to wake up a little bit. -Staal with a scoring chance but MacDonald makes the save. I'm just happy to see the puck in the other end for a change. -Back and forth. No major chances worth noting. Lot of balance now in this 3rd period. -Paul Martin with a nice offensive opportunity. Broken up by MacDonald. -Pens really falling back to play defense. 2 forwards backchecking at any given time. -Fleury in lockdown mode. 2:30 to go. -Game ends with another solid penalty kill by the Pens. That's game. Notes: Just taking care of business for the Pens. It was really quite a boring and uneventful period, which is A ok for a team protecting a 2 goal lead. 2 points from this one, and hopefully a few more upcoming before the all-star break. -Fantastic game from Chris Conner. People are starting to take notice of just how hard he works every night. -Tyler Kennedy's season has been resurrected ever since he was put on Staal's wing. Those 2 are really clicking. -Malkin played fine tonight. I don't know why everyone is criticizing him so much. -As the news spreads of Letestu's new contract, the pressure shifts to Talbot. Tonight he was average. He will need to be better than that. -Zbynek Michalek was a penalty killing beast tonight. -One of Letang's shakiest games in a long time. He did improve in the 3rd period, though. -Kind of a boring game. -I'm going to list the Staal line as line 1 tonight because they started the game and were out all night against Detroit's top unit. Quite honestly this was kind of a boring game. But the Pens were less boring and they have bragging right over Wings fans for at least the next few weeks. "A turnover off the goalie, a penalty shot, we paid attention to details"